The database tools team released 3 new GA releases and an update to our SQLCL. Some of the feedback we received was that ORDS was difficult to setup and running. This prompted an overhaul of the install process. There is now a few ways to get going. As with earlier releases, there is a command line. There is now a 'simple' , 'advanced' , and an option to parameterize ( silent ) install. The simple is the default and will ask minimal information. The catch is that it will make assumptions. Some of those assumptions like a USERS tablespace may not work for your database. In this case try the advanced, it will prompt for _everything_ and then some for a fully customized install. Taking the simple to install one step more, REST Data Services is now embedded into SQL Developer to be able to get up and running faster than ever. Under the Tools menu there is now options to Manage,Run,Install, and Uninstall ( although why would anyone? ). 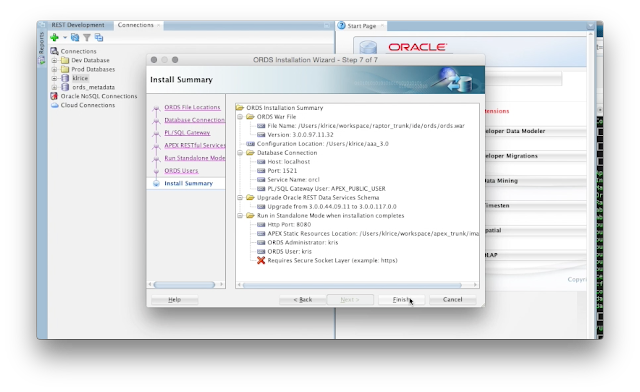 The first page of the installation will ask for 2 things. First if there is a specific ORDS to use or to use the embedded one. The version number is printed for which ever is chosen to ensure the proper decision. The second is simply where to store the configuration. This configuration is just the normal files and could be portable to take to any other ORDS to set it up. The next is the database credentials and connect strings. There is something new here in that the user is now ORDS_PUBLIC_USER. 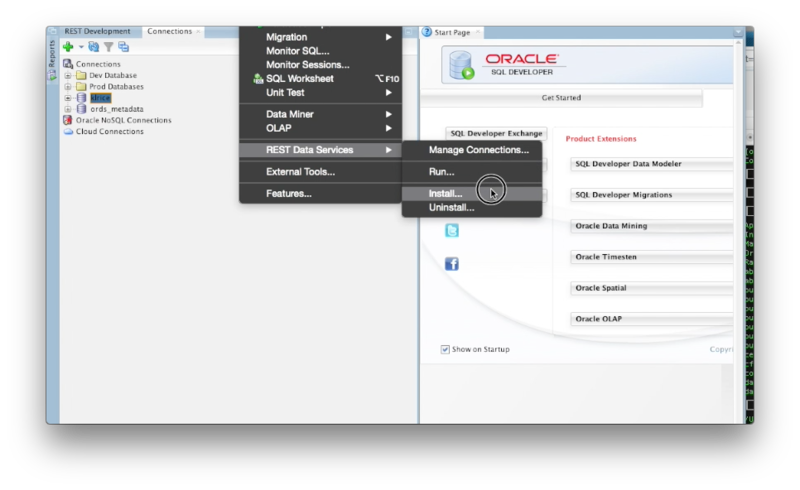 This is a change that has come in the decoupling from Application Express. Now ORDS is completely standalone and Apex is no longer required. If connecting to the ORDS_PUBLIC_USER fails ( as in user doesn't exist ), the wizard will prompt for the credentials needed to install ORDS. 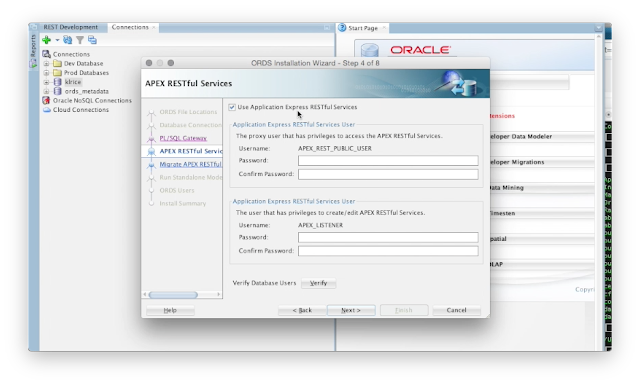 When using APEX or any OWA toolkit based applications, the db user for those to be executed as needs to be entered. In ORDS 2.x, the repository where the REST definitions were stored was inside Application Express' repository. ORDS 3.0 has it's on dedicated ORDS_METADATA database user which holds this information. This means that there could be definitions in both places. For Apex 5.0, the screens in the sql workshop will continue to operate against the tables in the Apex repository. That means to continue to operate this wizard will have to be filled out for the 2.0 users to access this data. When operating like this. ORDS will use the metadata from both the 3.0 repository and the Apex repository. This allows the flexibility to the developer where they would continue to develop. The new features such as Auto Enablement will only be in the new ORDS 3.0 repository. What this means to you. - If there is a conflict, ORDS repository will be chosen over the Apex repository. This screen will give the option to start ORDS up as soon as the wizard finishes installing and setting up. Also is the location for the static file, think /i/ for apex. The ORDS Administrator and ORDS RESTful User are used to connect to the running ORDS from SQL Developer for remote administrations. A quick final review of the options and it's up and running.